Today saw the first summertime cake from Gregg's. Gregg's is a restaurant/bakery in the Providence area that makes some very good fresh cakes. The restaurant serves up a lot of classic New England dishes and is quite popular. Their cakes however, made fresh daily and decorated by hand, are something a little more creative. You can check out all their offerings in the realm of desserts by checking out their website www.greggsusa.com! A Strawberry Cake that is anything but short! Simple decoration..just plop a few strawberries in a design on top! Check out how thick is the layer of whipped cream...which is mostly air after all! Today's cake which we have had before and love as a summertime treat was made with the ingredients of a classic strawberry shortcake. It is two layers of yellow sponge cake with copious amounts of whipped cream frosting. There were chopped up fresh strawberries inside and some whole strawberries adorning the top. In addition when you purchase this cake, Gregg's provides you with a container of strawberries in syrup to drizzle over your slices. This is a very nice touch and gives the cake that much more flavor. We could be negative and point out that this could well be a frozen strawberry syrup but instead will give Gregg's the benefit of the doubt and presume that it was homemade. Strawberries in syrup on the side! A little light on the interior strawberries which was probably fine with our fruitless vegetarian! The cake was enjoyed very much and proved very popular - especially among the summer students who are gearing up to create their own confections as part of student cake month. We did notice that one person, who we know to be a vegetarian, was not too keen on the strawberries. The strawberry syrup was okay just not the strawberries themselves either fresh or in the syrup. This seemed odd but we learned that it isn't just strawberries but any fruit...with the exception of mangoes. This was probably the first time we encountered a vegetarian who doesn't eat or like fruit. The opposite was true with the person who cleaned about all the strawberries off the top without eating a piece of the cake. They wondered how we knew. The indentations in the whipped cream where the strawberries were was the dead giveaway! There is a bakery near on the East Side of Providence that attracted the attention of one of our people who lives nearby. 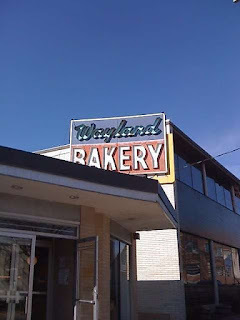 It is the Wayland Bakery on Wayland Avenue. Our colleague decided to run some of the products by the cake hour group and had previously brought in a cherry pie. This time around it was a replay of the pie theme and an apple pie and a strawberry rhubarb pie were served up. This got our colleague's attention. These are certainly good looking pies. The differing tops are a nice touch. For the apple it was the standard crust layer with the opening for the steam to get through. The strawberry rhubarb had the hatched type top finish. Both were done to a nice golden brown making the pies look most appealing. A crust just like Grandma used to make! Both pies were easy to cut into and held together well as slices. This is not always the case! A lot of pies fall apart once you cut them. You can trust us on that as we've had lots of pies. This apple pie had a moist crust that was not too sweet. The apple filling was likewise not too sweet with a good amount of cinnamon. The apple were not overly cooked and thus still somewhat crisp. This is preferable to apple mush filling where the apples are cooked to death. All in all it was a good pie. Golden brown and shiny like it should be. Each piece held up nicely after cutting. Did not take long before this was all that was left! However if it is mush that you wanted the strawberry rhubarb was the better choice. It is possible that the filling was premixed and precooked so that it became something like a compote. You really couldn't pick out a strawberry or a piece of rhubarb. This may be the way you need to go to successfully marry the two flavors together. The filling for this pie was definitely a filling and not just a bunch of baked fruit pieces. That is not at all to say that it was bad. On the contrary it tasted very good and was like the apple pie not overly sweetened. We have a couple of aficionados of this type of pie and they were very pleased. Thus we might conclude that the Wayland Bakery is a good choice if you are in need of pies. Remember this at Thanksgiving! Strawberry rhubarb puree as the filling. 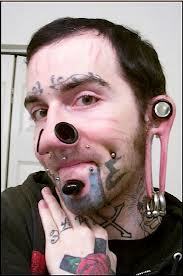 Our conversation today dealt with the issues of piercing and tattooing. There were not a lot of fans of either procedure. A few of the particular peeves were pierced noses being reminiscent of hogs, pierced lips and tongues, and too many ear piercings. 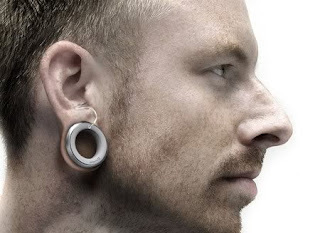 What really creeped us out were the people who get their earlobes pierced and then have these massive rings inserted sometimes large enough to get a coke can through. Given this particular dislike you can imagine how thrilled we get when someone with those indiscretions for ears serves you in some capacity like the recent sales clerk in New Hampshire. Of course we shouldn't be too judgmental as it turns out there are new hearing aids that are designed to be worn this way. This dude is more than over the top! A funky hearing aid for sure! Tattoos were also something that did not elicit many positive comments. Years ago they were a source of hepatitis B infections and some still remember that. Even though health standards have gotten better you still don't know in whom that needle was stuck before it entered your skin. Some people did express an interest is getting a tat but it was pointed out that if you do so you can largely say goodbye to working in the hospitality industry with the exception of funky restaurants and Starbucks. There aren't too many luxury hotels that will hire you with a visible tattoo. Bottom line is they can limit you so think twice before you get one. Good advice for high school students. This seemed like a good idea when I was younger! 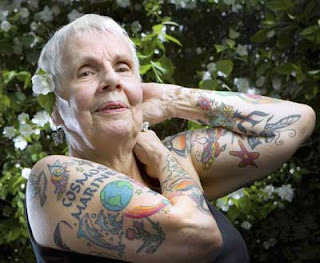 One of our interns told us about how one of his really old teachers would discourage people from getting tattoos. She would ask the question who is interested in getting a tattoo. If she got a response she would just raiser her two arms so that they were parallel to the ground and then shake them to show the movement of arm flab that develops later in life. Makes you think twice! Today we had a few interesting treats that were leftover from a farewell brunch. One of them was a box of Macau Husband Cakes. They were brought with a box of Macau Wife Cakes but for whatever reason the Wife cakes got consumed but not the husband cakes. Macau is once again part of China but was a Portuguese colony similar to Hong Kong prior to its reversion to China. It was and still is known for gambling. The better known of the two cakes is the Wife Cake or sweetheart cake. Literally translated the name means "Old Lady Cake". Presumably the translation for the Chinese name of the husband cake would be "Old Man Cake". We had one of our Chinese colleagues read it to us and she came up with the name "Old Person Cake" so we were close. Our two treats for the day courtesy of someone leaving! The wife cakes were gone but the Husband Cakes remain! A sweetheart or wife cake is a traditional Cantonese pastry with flaky and thin skin made with winter melon, almond paste, and sesame, and spiced with five spice powder. The cake is still popular among many in Hong Kong and Mainland China. There are some great legends as to how these came about so check out the Wikipedia page: http://en.wikipedia.org/wiki/Sweetheart_cake. These cakes were typical for an Asian pastry treat. They were not at all sweet and a touch on the dry side indicating they are good with a cup of tea or coffee in our case. They also had some roasted seeds on the outside contributing to the savory essence over the sweet. We enjoyed them but might some day wish to try some fresh ones as opposed to those boxed up for sale. In case you were wondering where they came from! least we knew what we were getting into. What do you suppose this is! It's the Koala's March and it's artificial! Kid Size packs not intended for further retail! This box contained several packs of cookie treats that were intended for children and not intended for retail alone...see the disclaimer. Inside were these little pillow like cookies that had the imprint of a Koala figure on the front. They were needless to say very cute and a hit with those prone to cuteness of things. They were absolutely fine with no gourmet pretense. Think of artificially flavored strawberry creme filled animal crackers and you will get the idea of what they were like. Universally deemed to be very cute! Made in Thailand for LOTTE USA with all the usual disclaimers! Husband Cakes and Koalas made for an interesting cake hour fer sure!